UNBREADED: Vintage Ad: "It's all energy!" 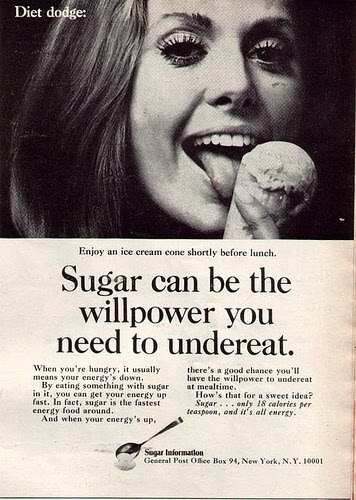 Another one from the "Sugar Makes You Skinny" files, this vintage ad claims that sugar gives you enough energy to "undereat". Ummm. Enjoy an ice cream before lunch. Sugar can be the willpower you need to undereat. When you're hungry, it usually means your energy's down. By eating something with sugar in it, you can get your energy up fast. In fact, sugar is the fastest energy food around. And when your energy's up, there's a good chance you'll have the willpower to undereat at mealtime. How's that for a sweet idea? Sugar... only 18 calories per teaspoon, and it's all energy. Empty calories plus blood sugar spikes plus undereating? SO nutritious! I wonder if an all-sugar diet will make my eyelashes spike out like that.